Less than a 4-hour drive southeast of Auckland, you’ll find Rotorua. For those who truly want to experience the authentic culture of New Zealand, this area is a must-visit. 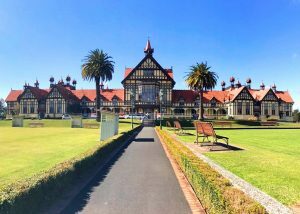 Home to Te Puia – a Maori cultural center and geothermal preserve – Rotorua is the quintessential New Zealand that most of us picture. This is one of the best places to experience the culture of the Maori, New Zealand’s indigenous Polynesian people. Enjoy an authentic Maori cultural performance, flax weaving workshop, and a feast of Maori kai at Te Puia. 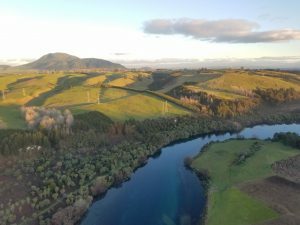 As you venture further into Rotorua, you’ll find yourself surrounded by scenery that feels straight out of the Lord of the Rings trilogy – because it is. 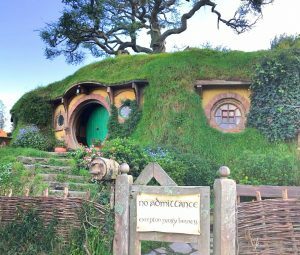 You can even visit the world’s only permanent movie set, Hobbiton, which is located on a still-working sheep farm. Visit Kuirau Park, a beautiful local park with naturally occurring hot springs and geothermal baths. And don’t forget Waitomo Caves, where thousands of glow-worms light up the inside of the cave so that it feels like you’re floating in the middle of the night sky. After a day of exploring, head over to Polynesian Spa, where you can enjoy a soak in their sulfur pools before indulging in a mud massage. All of these adventures make for a very tiring day, so be sure to book a luxurious stay at the striking Treetops. This modern lodge is located in the middle of 2500 acres of 800-year-old native forest, offering over 35 miles of adventure trails and a spa that offers traditional treatments and Maori rituals. 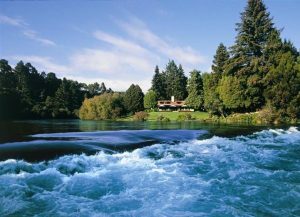 Just outside of Rotorua in the heart of the North Island lies Lake Taupo, New Zealand’s largest lake and the world’s trout-fishing capital. This lake dramatically flows into the stunning blue water of Huka Falls, which serves as the perfect backdrop for you to enjoy the luxurious Huka Lodge. This property offers the original quintessential lodge experience, and has consistently been rated one of the world’s best since its opening in 1924. 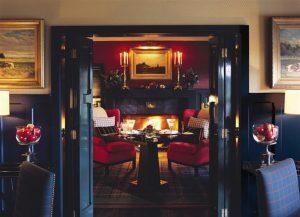 You can settle into one of the 20 sumptuous suites, or splurge on the Huka Cottage for the ultimate in exclusivity. Activities abound, and you can enjoy fly fishing, biking, and hiking all around the Falls. Though it may be difficult to want to leave the property, you can also enjoy some high-adventure excursions in Taupo like bungy-jumping, white-water rafting, or helicopter excursions.